Indianapolis is the kind of city Levelers love - tidily laid out downtown with sports, theaters, museums, the zoo, good restaurants and night life within a relatively short, level walk. Other things you want to see are within easy reach of public transportation and cabs. It will surprise you with how much it has to offer and how eager its residents are to help you discover the best of their town. In short, a city with urban sophistication and Midwest charm. I was there for a convention that I often wished would go away so I could savor more of the city. 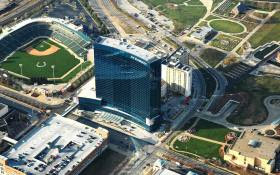 I stayed at the JW Marriott, world's largest, which is across the street from the Indiana Convention Center, Victory Field Baseball Park, White River State Park. 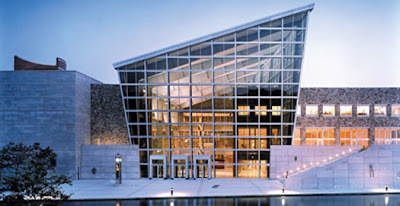 Indiana State Museum and IMAX Theater, Eiteljorg Museum and the Visitors Center. It's a huge, well-appointed and located hotel with an attentive manager, but - Tip - you will walk a lot between your room and an exit. Nearby and also across from the Convention Center are the Marriott and Westin. Another block away or so are Holiday Inn Express, Comfort Suites, Staybridge Suites and Crowne Plaza, all across the street from Lucas Oil Stadium. home of the Colts. Other downtown hotels include Hyatt Regency, Omni Severin, Homewood Suites, Hampton Inn, Canterbury, Embassy Suites, Contrad, Hilton Garden Inn, Sheraton, Hilton, Residence Inn by Marriott and Courtyard by Marriott. Surprised to find so many? So was I. 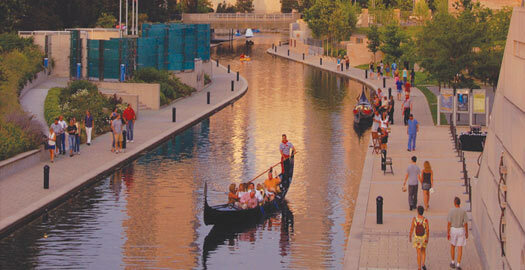 Walk, job, cycle or gondola at White River State Park. White River State Park is right downtown with walking, jogging, Segway and biking trails, the White River for boating or taking a gondola ride, the Indianapolis Zoo and White River Garden plus three major museums. Just one of the Indianapolis Zoo's many attractions. 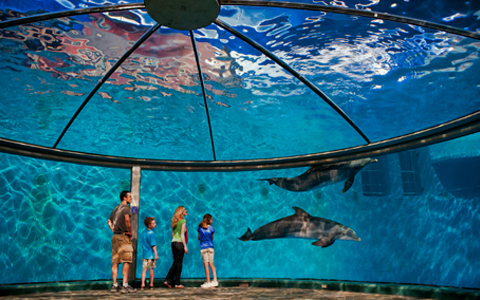 Indianapolis Zoo and White River Garden features 350 different animal species in nearly 70 wooded acres and a 3.3-acre garden. Tip: This will fill half a day so don't plan anything strenuous afterwards. 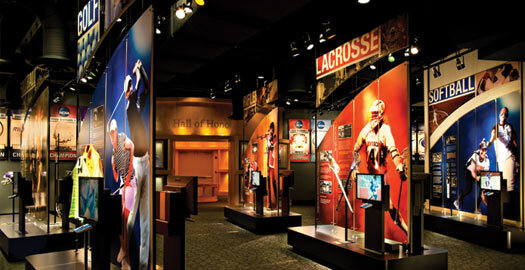 NCAA Hall of Champions and Conference Center is to college sports fans what the Kentucky Horse Park is to horse lovers. Covering 23 sports, you're bound to find a group or a school you've rooted for. Indiana State Museum and IMAX Theater is three stories of dinosaurs, a prehistoric giant squid, Indiana art and one of the world's largest collections of Abraham Lincoln memorabilia. Kids of all ages love it and the six-story-high screen of the IMAX Theater. The Eiteljorg is a must see. 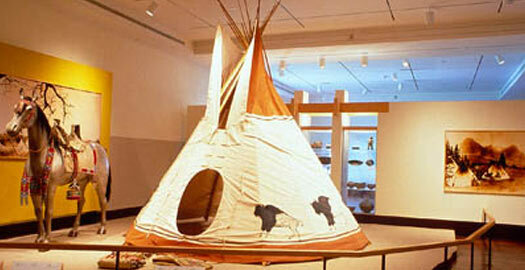 Eiteljorg Museum of American Indians and Western Art is a gem, no ifs, ands or buts about it. If you've never heard of it, welcome to the club. Anyone whose childhood included cowboys and Indians will relive those glory days as they find old friends - originals rather than the mediocre reproductions, genuine artifacts rather than tourist reproductions - in the museum's galleries and hallways. It's worth a half day of time and the shop just might keep you there for the rest of the day. A must see. Tip: There are steps here but it's well worth the effort to get in and around. Indiana Roof Ballroom, since 1927 the downtown place to be for music and social events, is above the Indiana Repertory Theater. It's a remarkable space with a great dance floor. Who could resist a building that looks like this? 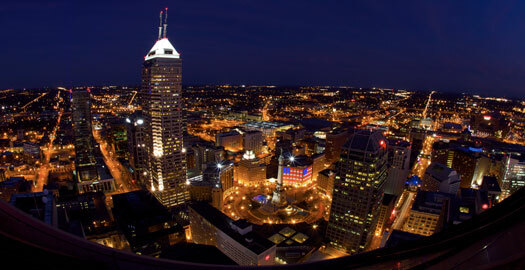 The Children's Museum of Indianapolis is away from downtown but don't miss it. I did and can't wait to get back and spend a day here. 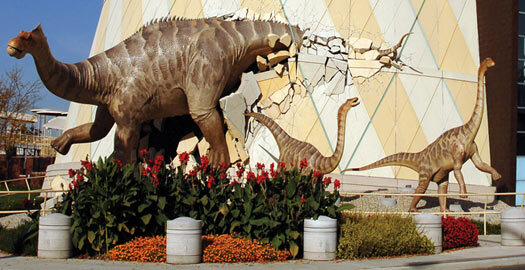 The life-sized dinosaurs "crashing through" the building's exterior make it irresistible and child magazine says it's not only the world's largest children's museum but the best. That's recommendation enough for me. IMA has the first Love. 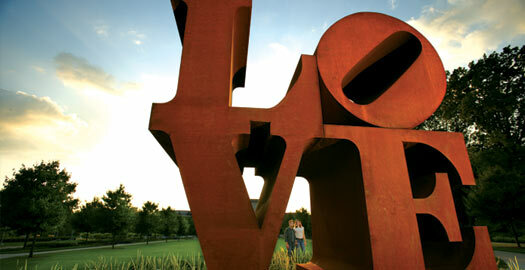 Indianapolis Museum of Art, also away from downtown, is another surprise. Not the first iconic Love sculpture by native son Robert Indiana, but the depth of its collection and its beautiful grounds, actually a 100-acre park. They include a sculpture garden that I didn't have time to visit (night was falling as I arrived). The collection - rich in Turners, Gauguins, Seurats, O'Keefes and an early Rembrandt self-portrait - was treat enough. Tip: Elevators are conveniently located. 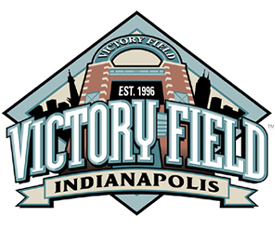 The Colts weren't playing so I can't tell you about Lucas Oil Stadium, but if you can catch an Indians baseball game at Victory Field, treat yourself to it. Small, well-equipped (good beer) with great sight-lines, it's a fun place. Hard to imagine what it must be like on race days, but you can get the racing experience, riding along with a professional driver on the actual track. I did a pace car ride along with Indy driver Martin Plowman. Fast and fun, fun, fun, although hell on hairdos. • enough gas for the 3-MPG race cars. 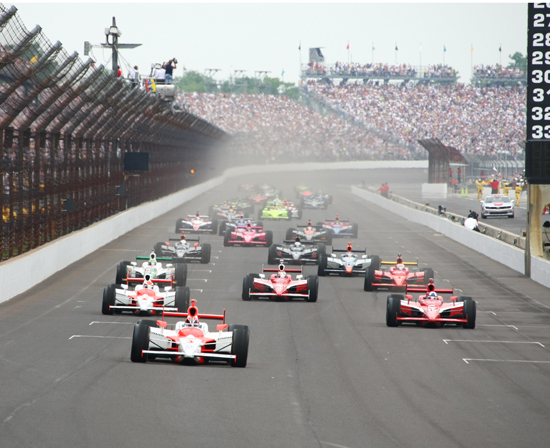 • The Indy 500 is the world's largest single-day sporting event. Tip: It's big but it's flat with elevators to the higher spots. Attending a convention where business is done at meals doesn't leave many opportunities for dinging out but I did manage to try two very different spots in the restaurant-filled Broad Ripple district. Zest is one you might have heard of thanks to Guy Fieri's popular Food Network "Diners, Drive-Ins and Dives" show. 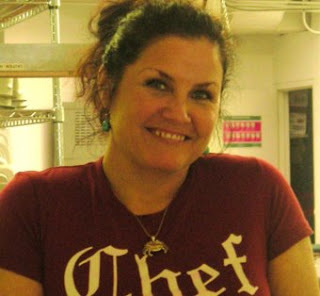 Fun, quirky and casual, with a dog-friendly patio, it's the labor of love of Executive Chef/Partner Valerie Vanderpool. 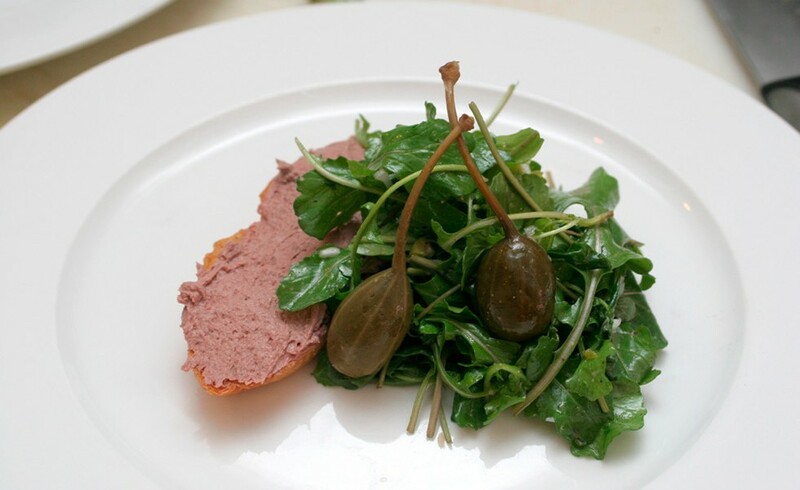 Think uptown versions of down-home favorite foods. If her halibut is on the menu, I can attest it's excellent. Warning: Portions are huge. Whatever is served at Recess will be creative and fresh. Recess, in So Bro (south of Broad Ripple) is the small, industrial sleek culinary playground for Chef/Owner Greg Hardesty. It's four-course prix fixe ($52-$58, wine and alcoholic beverages extra) and he cooks what he wants with the menu changing every day. You won't get bread - "People eat too much bread," said Hardesty. Sample menu for Jan. 26, 2013: hedgehog mushroom and shrimp salad, preserved lemon, salsify, rosemary, arugula; fillet of fluke, SG capicola, green beans, red grapes, brown butter puy lentils; Fischer Farms beef striploin, blue cheese creamed spinach, baby red potatoes, turnips, red wine gastrique; oatmeal doughnut, maple banana mousse, blueberries, hazelnuts for $54. If you like what he's cooking, you'll get your money's worth. Reservations are a must. 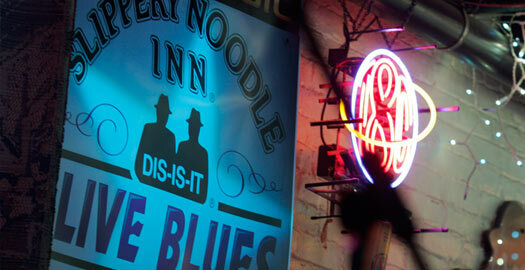 Slippery Noodle Inn has live blues seven nights a week. The Slippery Noodle Inn downtown is not only the oldest bar in Indiana (1850), according to Rolling Stone magazine and a host of pals, it's one of the nation's top blues bars.